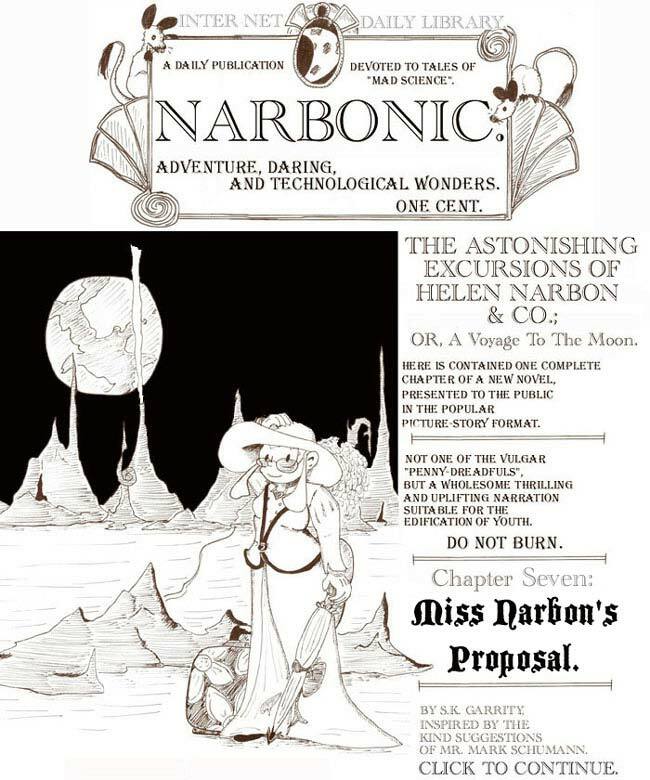 The Astonishing Excursions of Helen Narbon &co., Chapter Seven. First, my apologies to the people reading this in May 2008: I’ve been trying to shuffle the archives into the correct order, and the Sunday stuff is getting mixed around. Sorry about that. Okay, on to the Victorian serial! 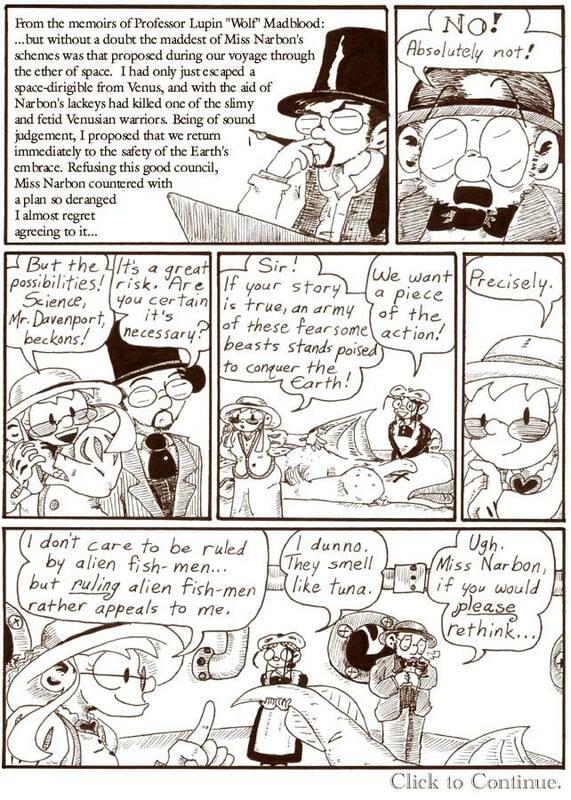 I remember being very pleased with the way Madblood came out in the first panel. Now I’m not sure why; it’s not awful, but it’s nothing special, although I like his casual open-tie-and-vest look. My backgrounds are kind of hilariously crude here. Drawing is hard! I do like that the “bolded” text is represented with Victorian-style curclicues. The nature of Victorian Helen’s plan isn’t revealed until the next chapter, which, fortunately, I only waited a few weeks before drawing. It could’ve been much worse. Of all the art problems in this page, the one I get hung up over is that Madblood’s hand in the first panel is wrong. It’s all short and chubby and looks like it should belong to Helen. You know that episode of “Red Dwarf” where the ship’s holodiscs get mixed up and Rimmer ends up with another crewmember’s arm, and it’s all hairy and has tattoos and keeps punching him? It’s like that. This page is only two-thirds length, which I can do because INTERNET. This is another page that, in a print edition, would have to include amusing or disturbing Victorian advertisements. How about radium? Good for what ails ya! Also, weight-gain powders. I’ve seen them advertised in old comics from the 20th century, but it’s always funny.